A tall, chiselled beauty that tapers into a bulbous base before reaching out, for that added sparkle to every sweet delight – The Quadro Milk Shake glass makes for an uber-classy presentation of those charming floats, sundaes and of course, milk shakes, with its immaculate French glassware and subtle, rippling design. We offer tall type glass & containers in different sizes & colours as per the client requirement. 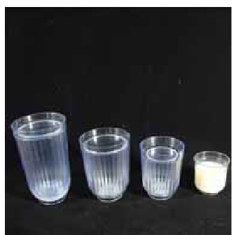 We are the leading manufacturer and suppliers of Designer Milk Glasses in Coimbatore, Tiruppur, Erode, Salem, Krishnagiri, Vellore, karur, Thoothukudi, Ooty, Hosur Palani, Dindigul, Villupuram, Trichy, Tiruchirapalli, Pollachi, Madurai, Chennai, Kerala etc.